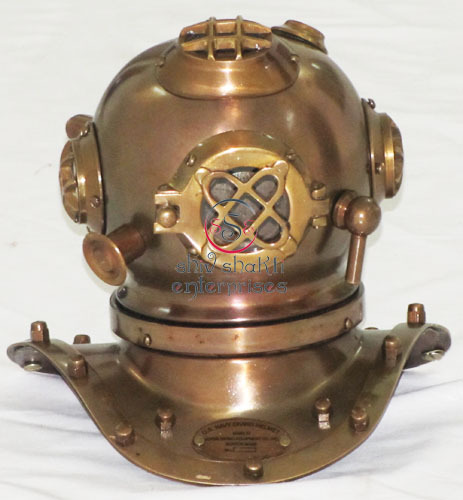 ﻿Our beautifully handcrafted sea diver's diving helmet is a complete theme of nautical flair. We have tried to make it as an original look. 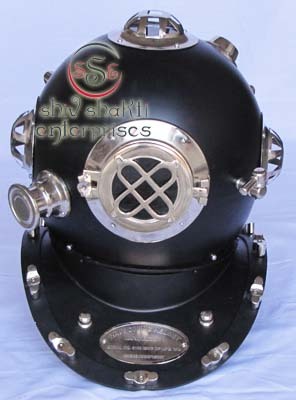 This is a reproduction diving helmet & not wearable.﻿All work is hand made.it is a best gift for collectors. 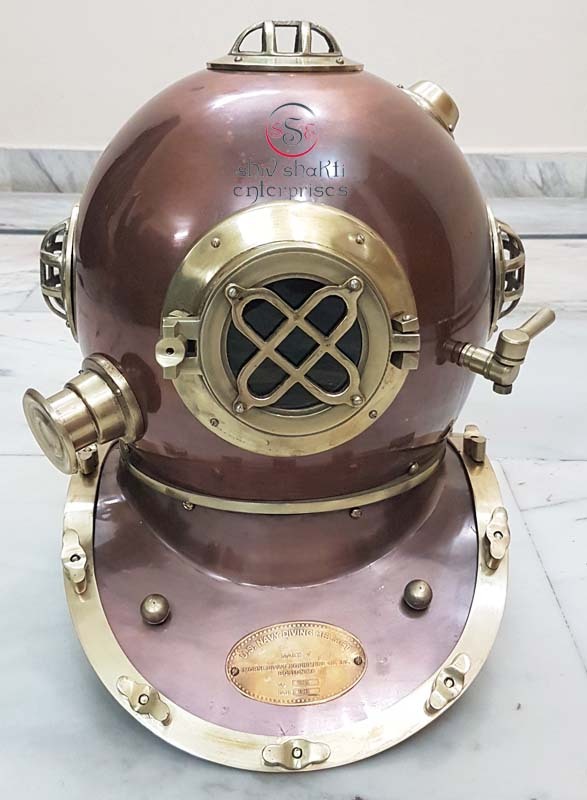 A hand made replica Divers Helmet. 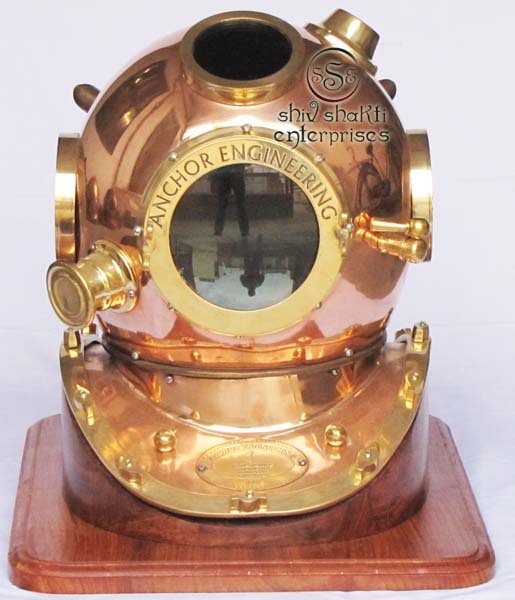 Anchor Engineering Diving helmet- Divers Helmet -18" Sea Deep Diver Collection.Magnifying glass and Ring. 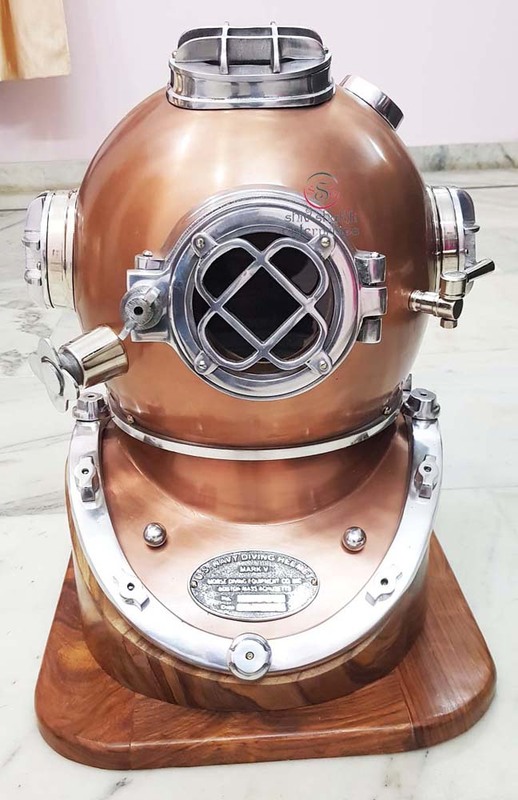 This Diving Helmet is Engraving Anchor Engineering .Our Anchor Engineering Diving Helmet is one of the best diving helmets in the world﻿. 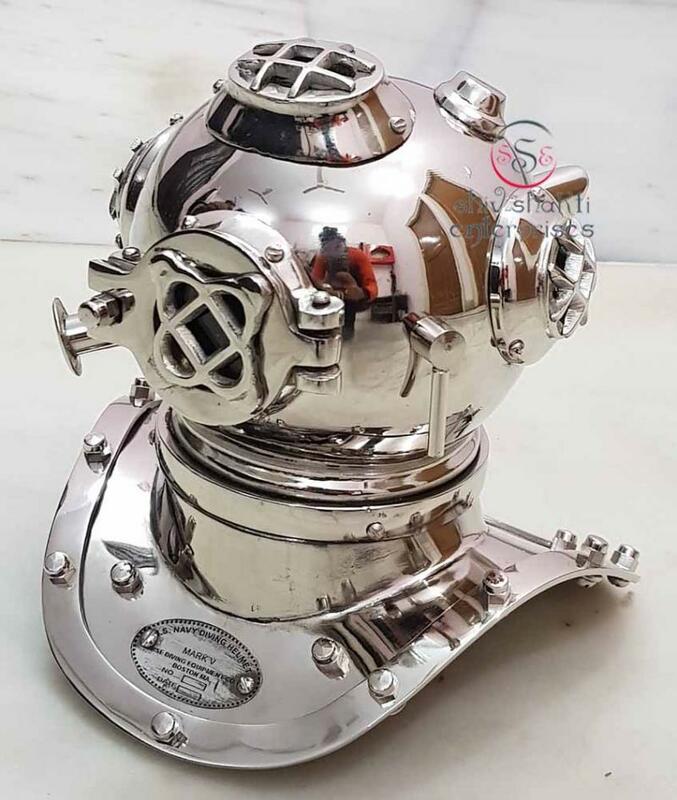 This is Beautiful Diving Helmet.It is a best gift For collectors.Magnifying glass and Ring.Diving Helmet is one of the best diving helmets in the world﻿. 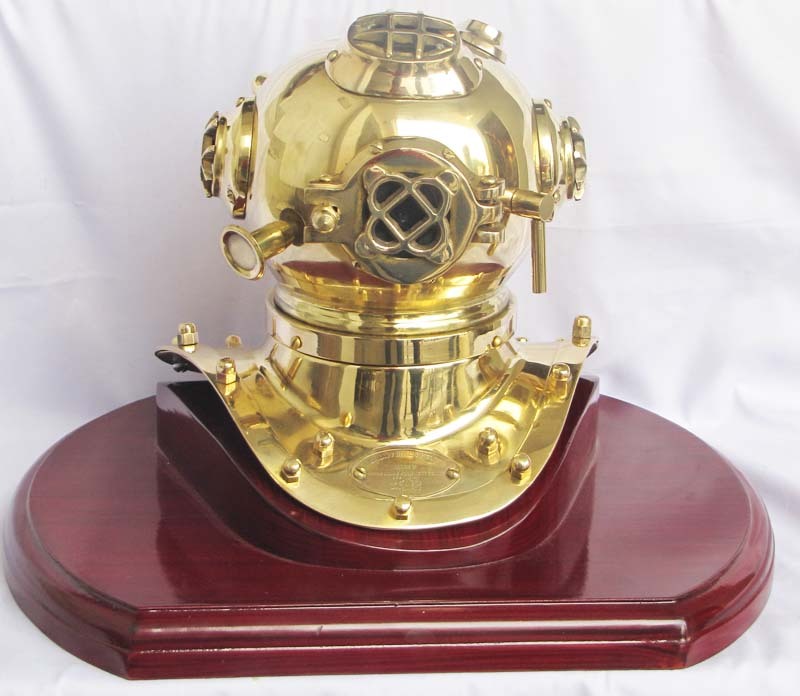 Our beautifully handcrafted sea diver's diving helmet is a complete theme of nautical flair. We have tried to make it as an original polish look. 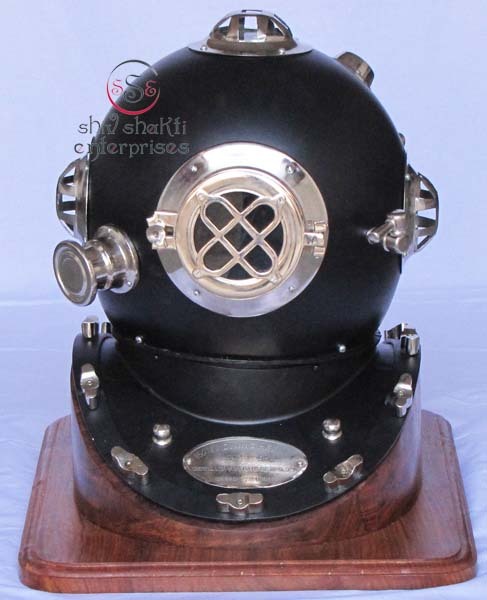 This is a reproduction diving helmet & not wearable.﻿All work is hand made.it is a best gift for collectors. 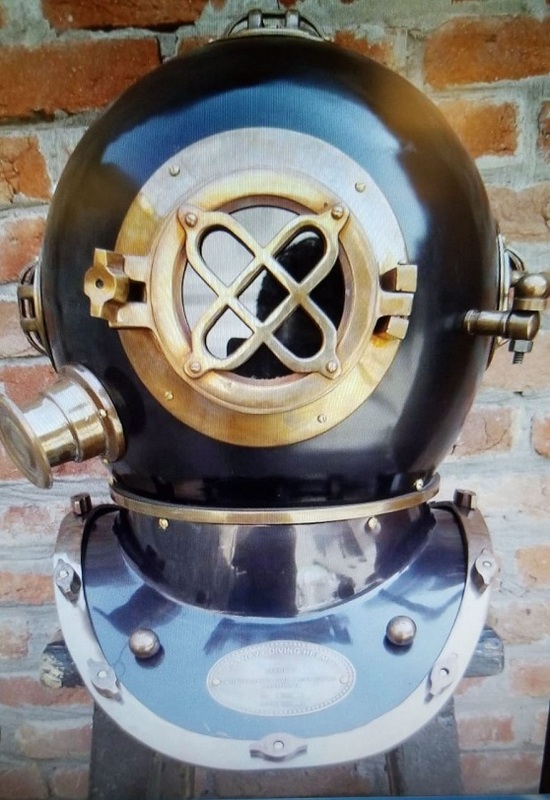 A hand made replica Divers Helmet. 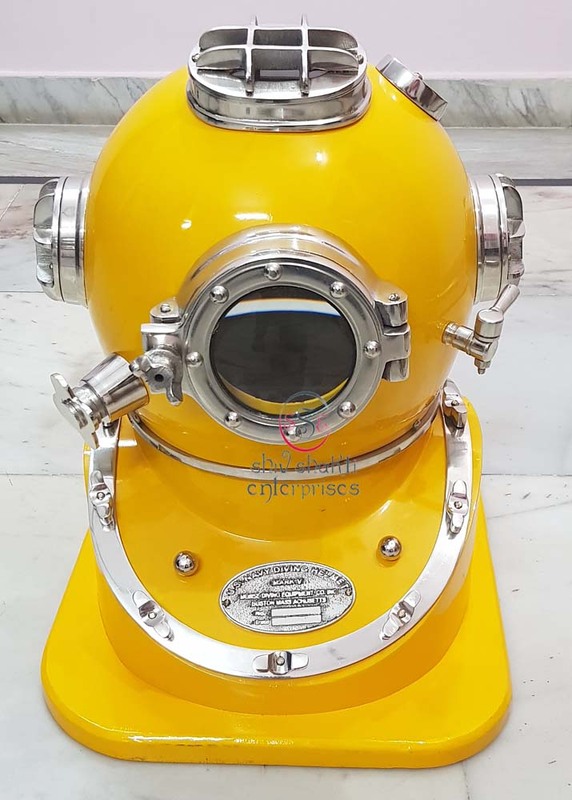 ﻿We offer superior quality diving helmets and ensure an executive class in our range of diving helmets. 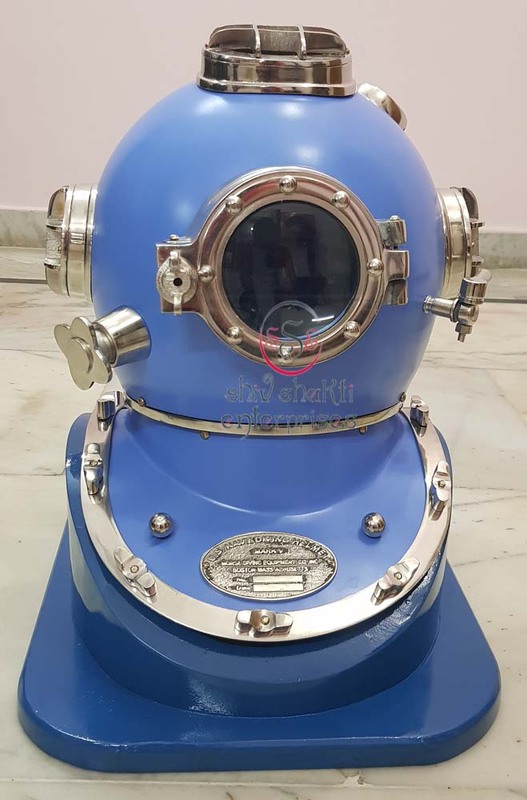 These helmets are manufactured from top quality raw materials as per the latest international quality standards.This diving helmet with wooden base. 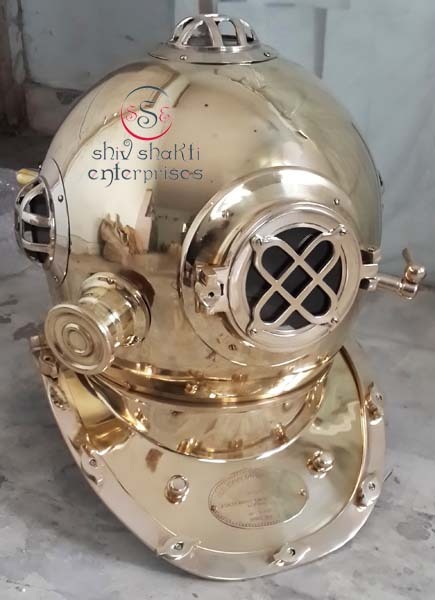 ﻿This is awesom quality divers helmet.It is made of Brass &Steel.We offer superior quality diving helmets and ensure an executive class in our range of diving helmets. 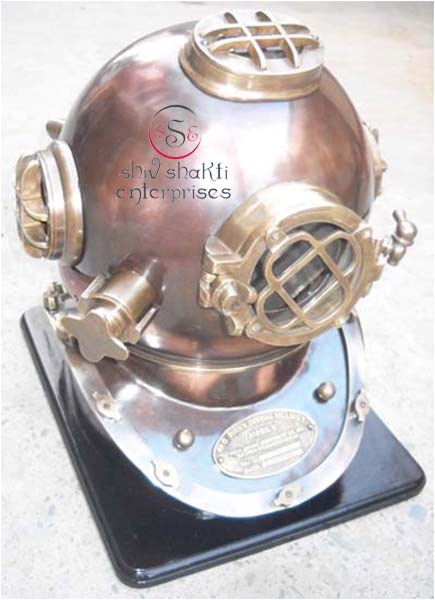 These helmets are manufactured from top quality raw materials as per the latest international quality standards. 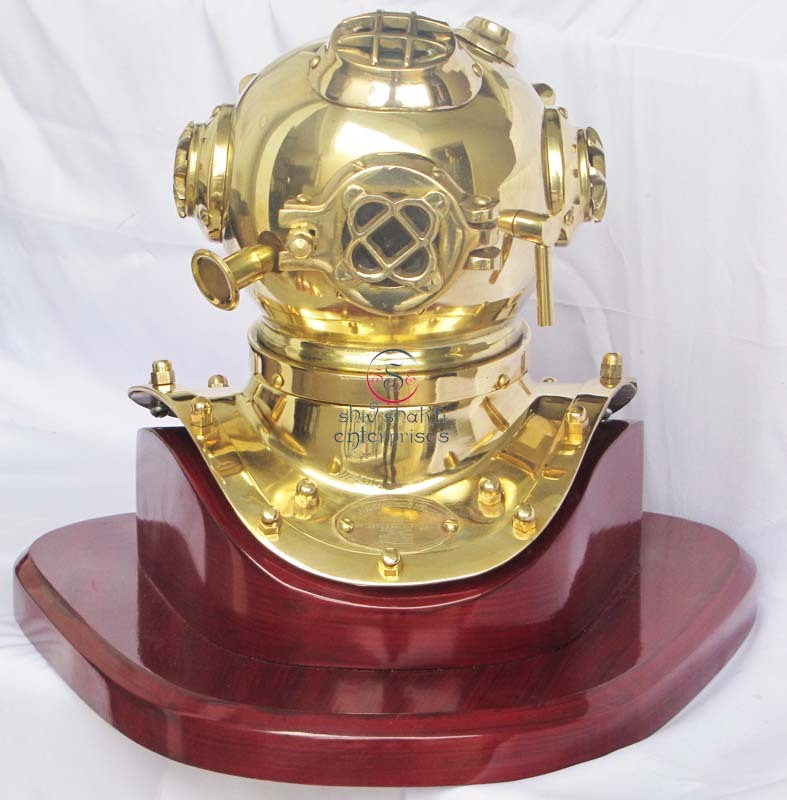 Our beautifully handcrafted sea diver's diving helmet is a complete theme of nautical flair. We have tried to make it as an original look. 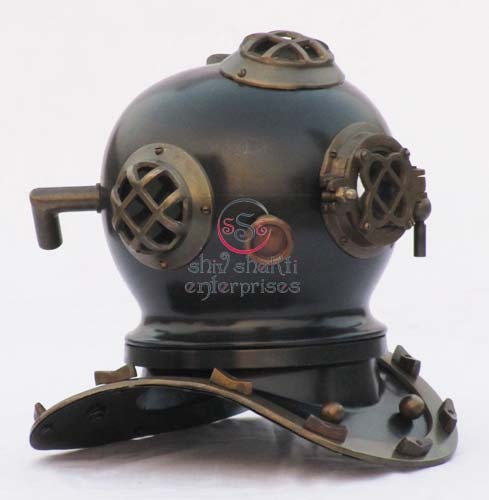 This is a reproduction diving helmet & not wearable.﻿All work is hand made.it is a best gift for collectors. 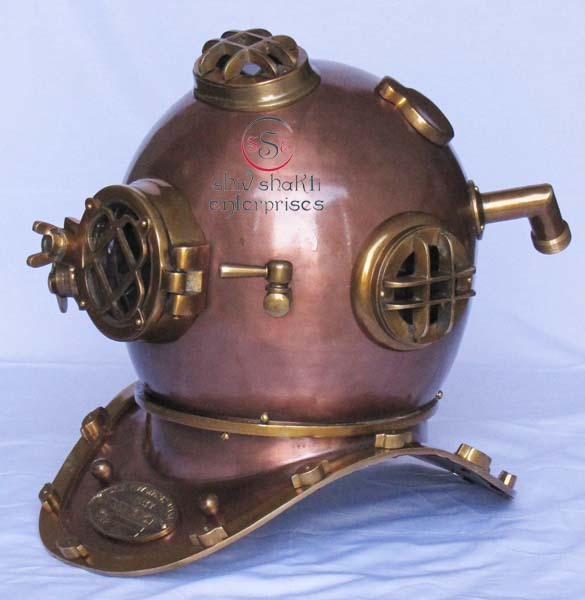 A hand made replica Divers Helmet. 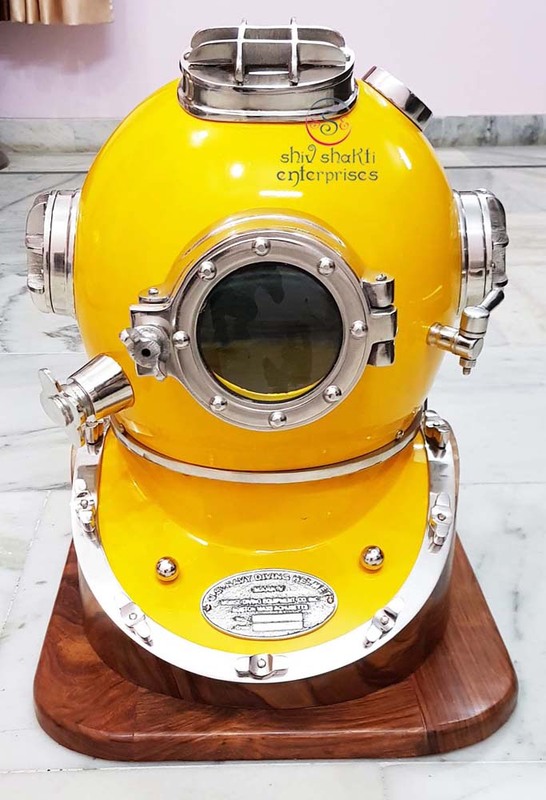 Beautiful Finish Helmet for collector. 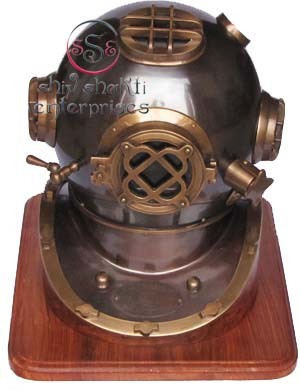 ﻿Our beautifully handcrafted sea diver's diving helmet is a complete theme of nautical flair. We have tried to make it as an original antique look. 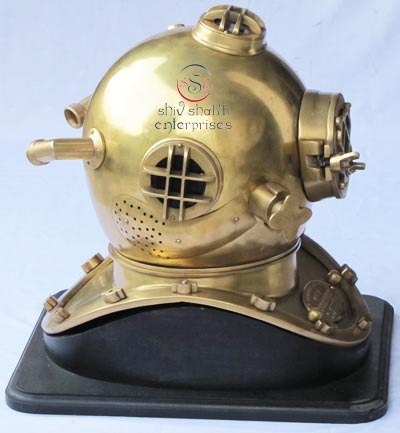 This is a reproduction diving helmet & not wearable.﻿All work is hand made.it is a best gift for collectors. 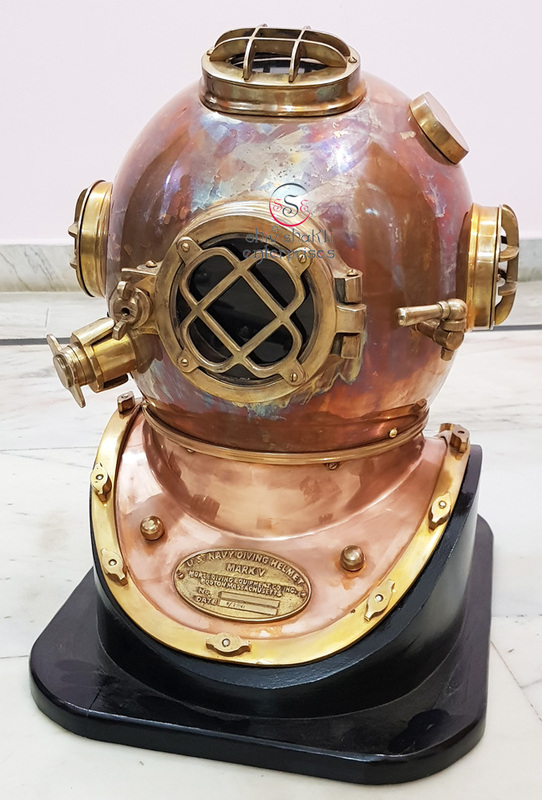 A hand made replica Divers Helmet. 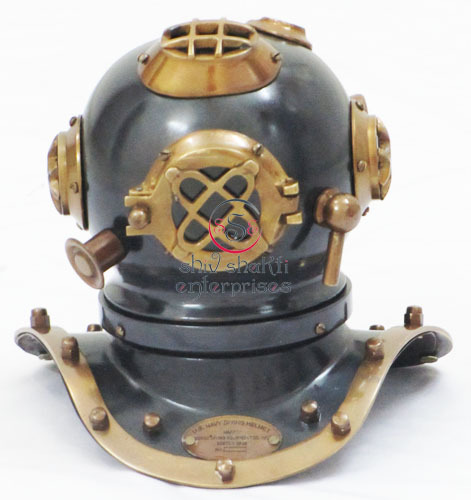 Our beautifully handcrafted sea diver's diving helmet is a complete theme of nautical flair. We have tried to make it as an original antique look. 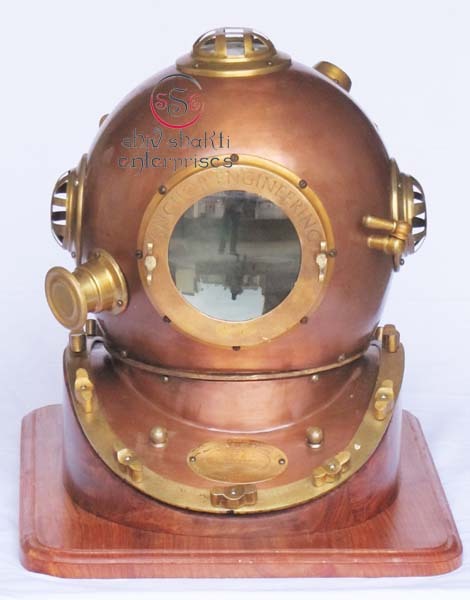 This is a reproduction diving helmet & not wearabl.This Diving helmet with Wooden Base. 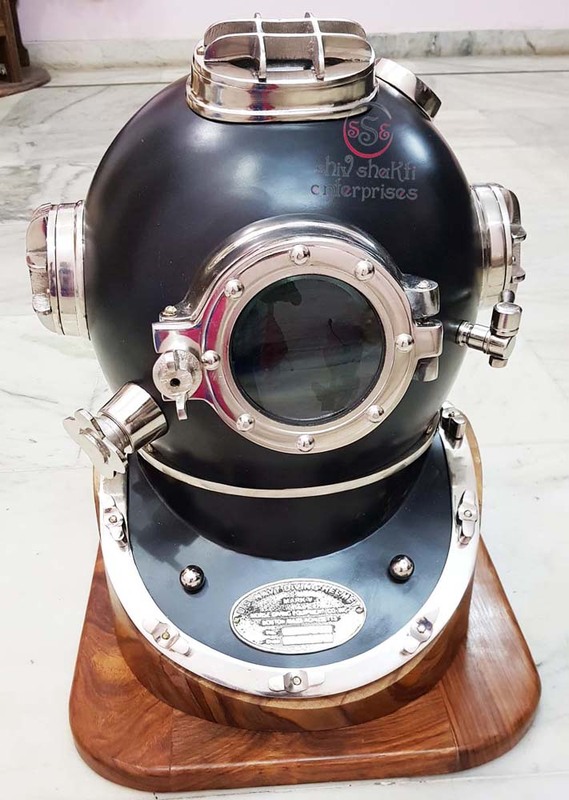 Beautiful Finish Helmet for collector.Our beautifully handcrafted sea diver's diving helmet is a complete theme of nautical flair. We have tried to make it as an original look. 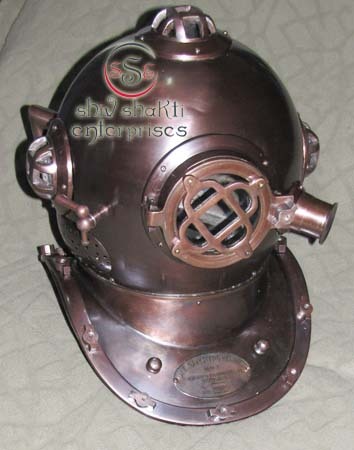 This is a reproduction diving helmet & not wearable. 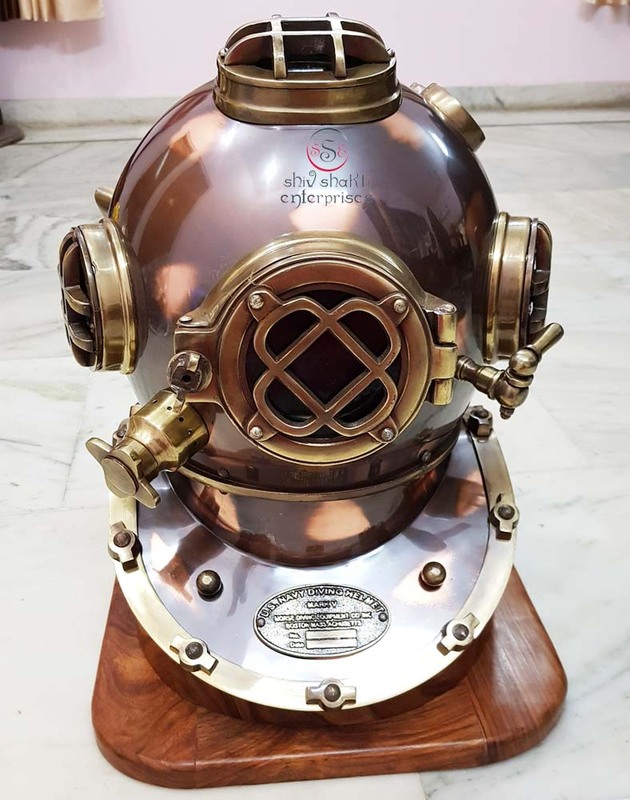 This is Beautiful Diving Helmet.It is a best gift For collectors.Diving Helmet is one of the best diving helmets in the world﻿. 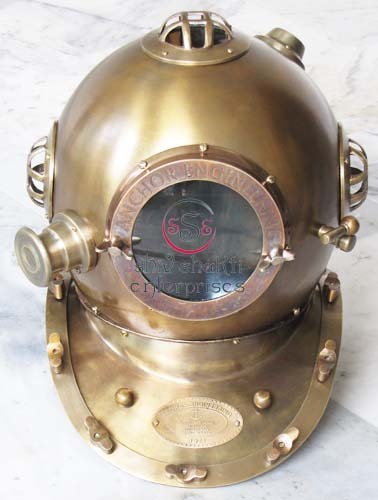 Our beautifully handcrafted sea diver's diving helmet is a complete theme of nautical flair. We have tried to make it as an original look. 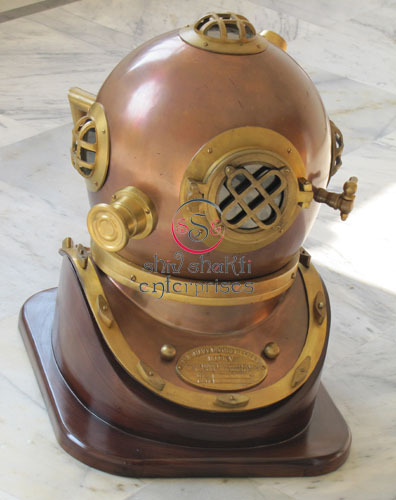 This is a reproduction diving helmet & not wearable. 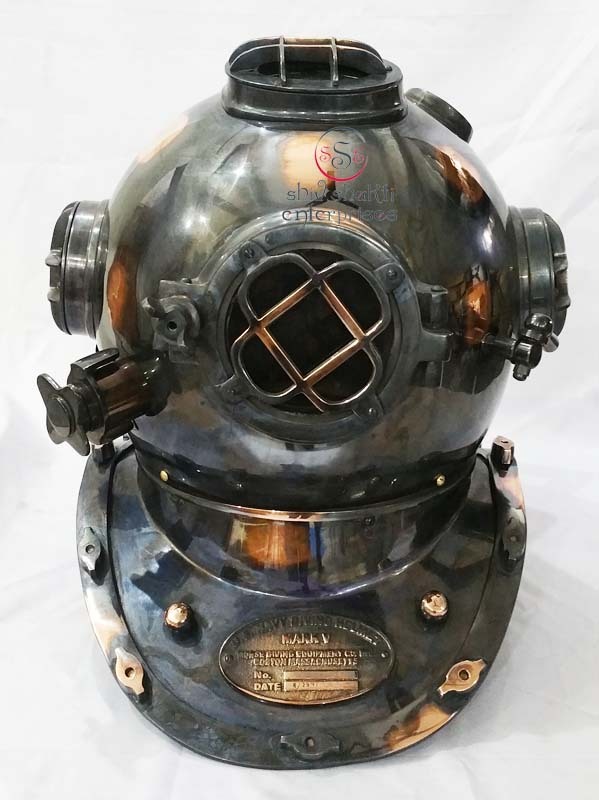 Beautiful Finish Helmet for collector.Our beautifully handcrafted sea diver's diving helmet is a complete theme of nautical flair. We have tried to make it as an original antique look. 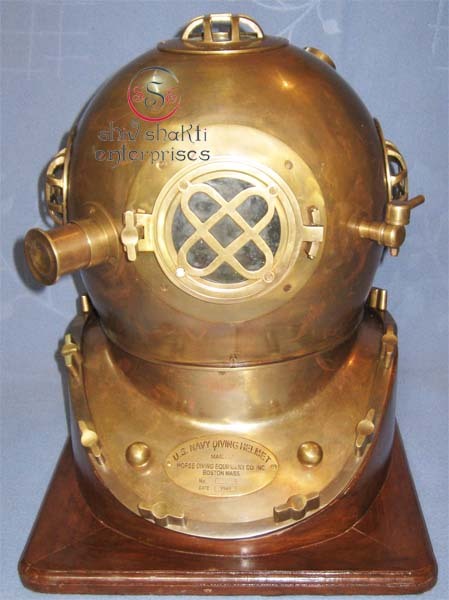 This is a reproduction diving helmet & not wearable. This Helmet has a marked Name Plate. 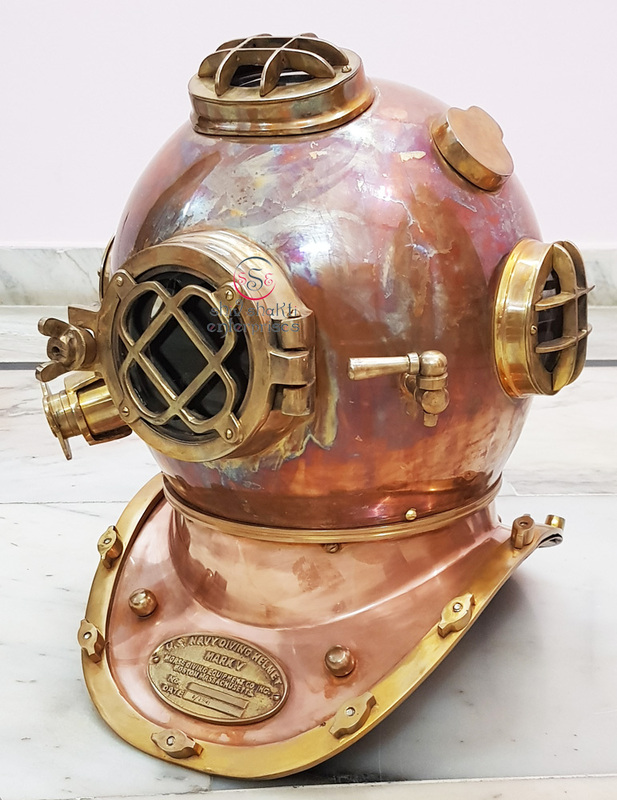 Made of solid brass & Iron Antique Finished. Helmet is very Good Condition. 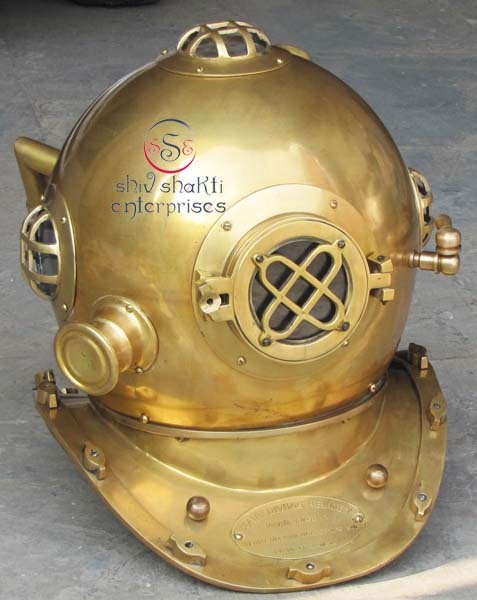 This is an excellent quality made helmet.It is totally Hand Made. 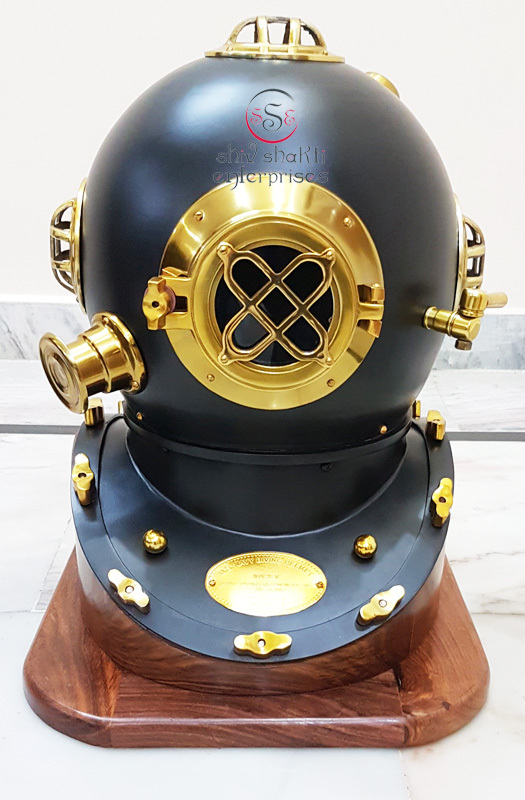 Beautiful Finish Helmet for collector.Our beautifully handcrafted sea diver's diving helmet is a complete theme of nautical flair. 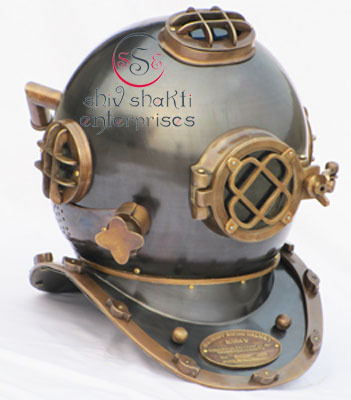 We have tried to make it as an original look.All work is totally hand made.this is beautiful replica divers Helmet. This Helmet has a marked Name Plate. 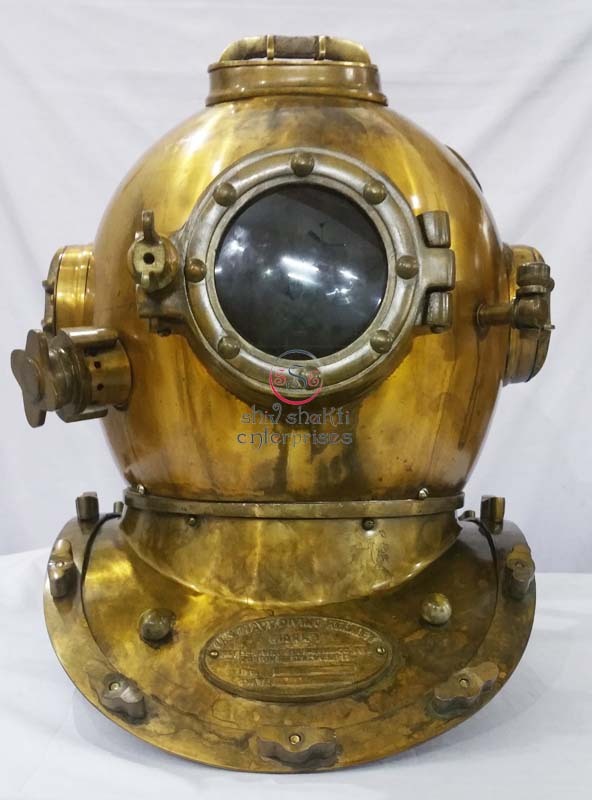 Made of solid brass .Helmet is very Good Condition. 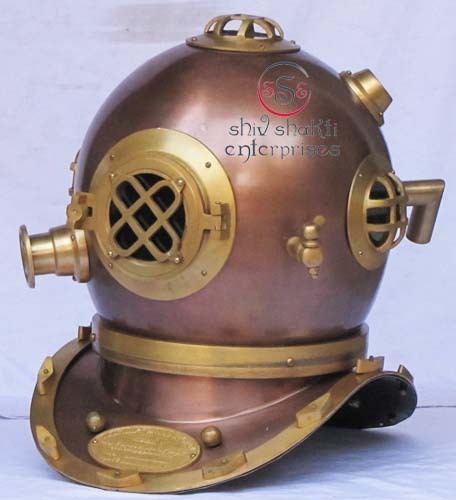 This is an excellent quality made helmet.It is totally Hand Made. 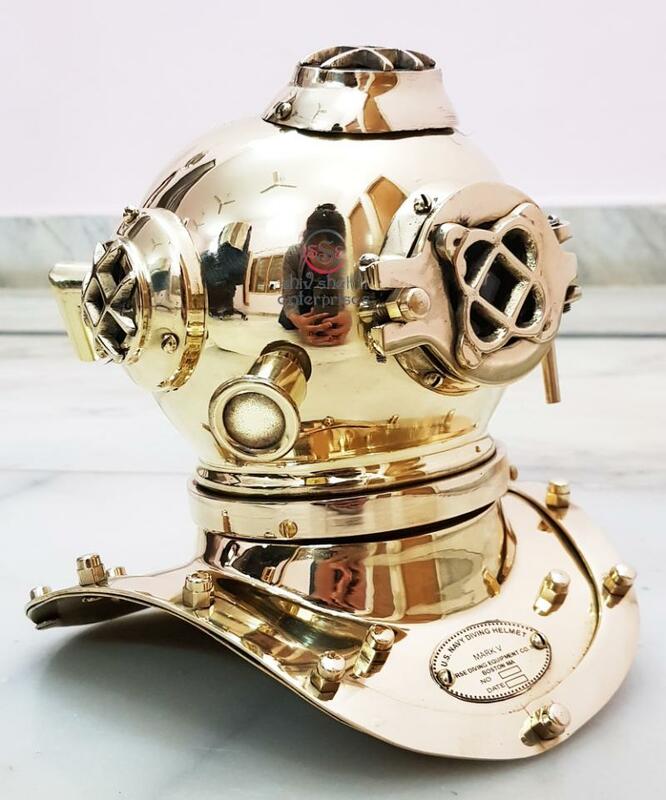 Our new, unique steel and brass antique diving helmet replica features handcrafted black powder coated sheet steel and solid brass, gleaming nickel finished fittings. 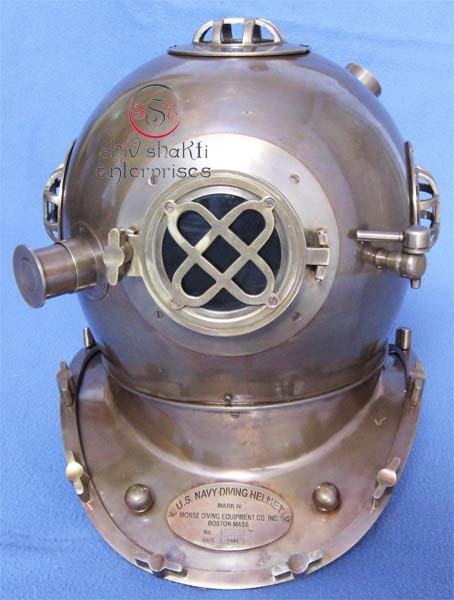 ﻿Large chrome finish manufacturing tag on breastplate reads "Navy Diving Helmet, Mark V Mod-1". 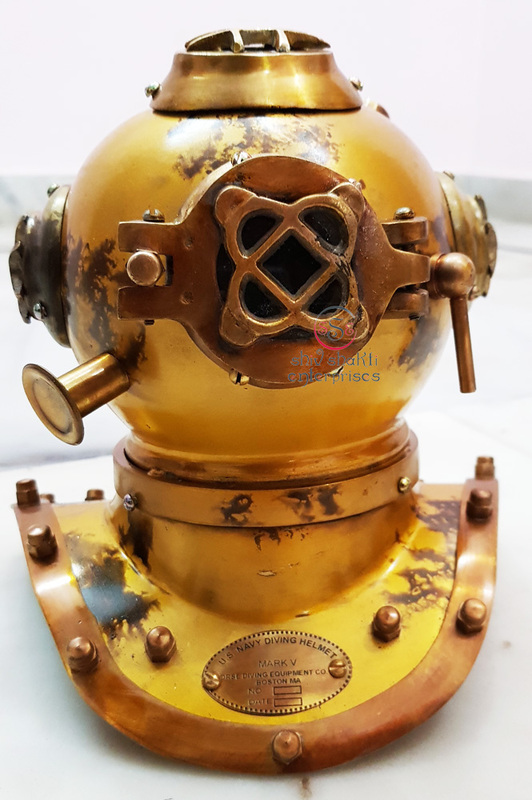 Our new, unique steel and brass antique diving helmet replica features handcrafted black powder coated sheet steel and solid brass, gleaming nickel finished fittings. This Helmet has a marked Name Plate. 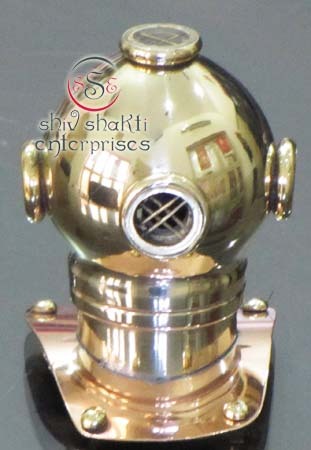 Made of solid brass & Iron Antique Finished. Helmet is very Good Condition. 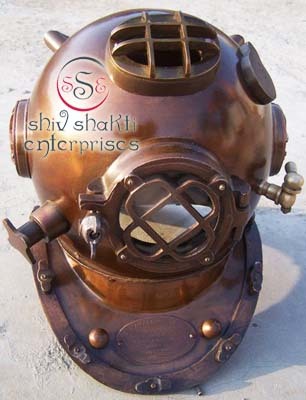 This is an excellent quality made helmet.It is totally Hand Made. 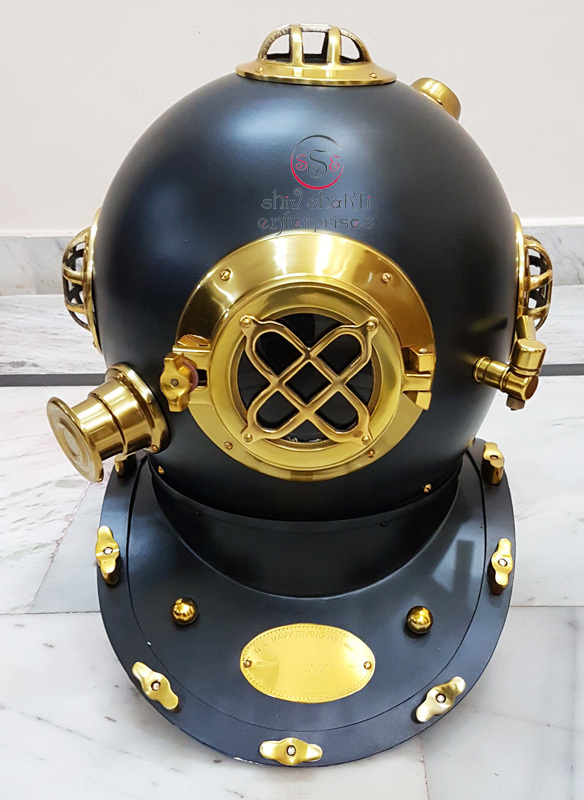 ﻿Our new, unique steel and brass antique diving helmet replica features handcrafted black powder coated sheet steel and solid brass, gleaming nickel finished fittings. This is an excellent quality made helmet.﻿This Helmet has a marked Name Plate. 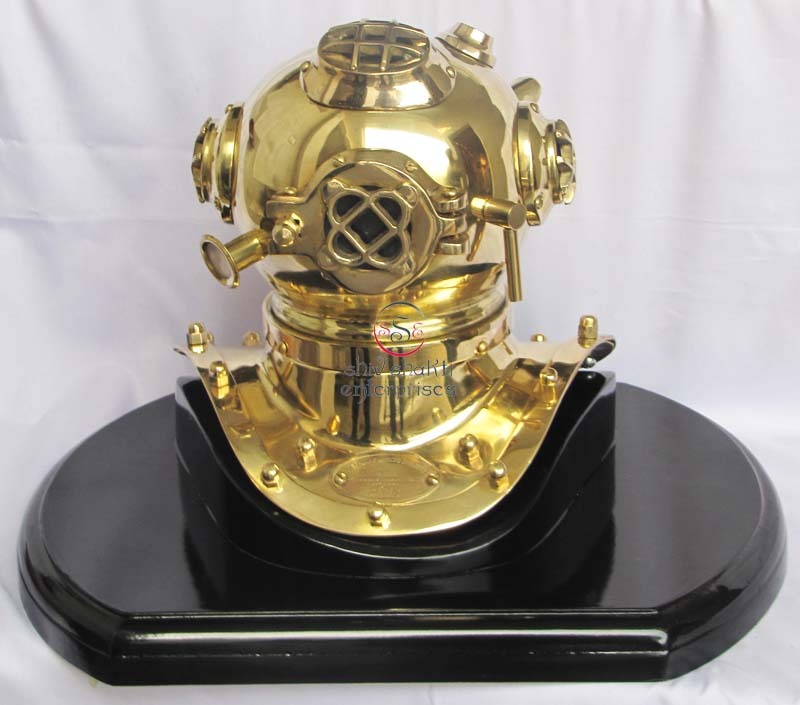 Made of solid brass & Iron Antique Finished. 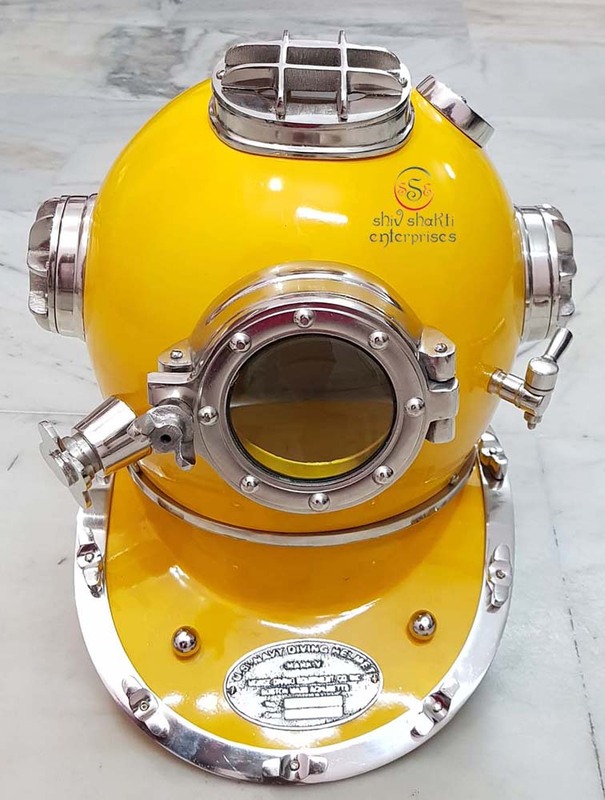 Helmet is very Good Condition.It is totally Hand Made. 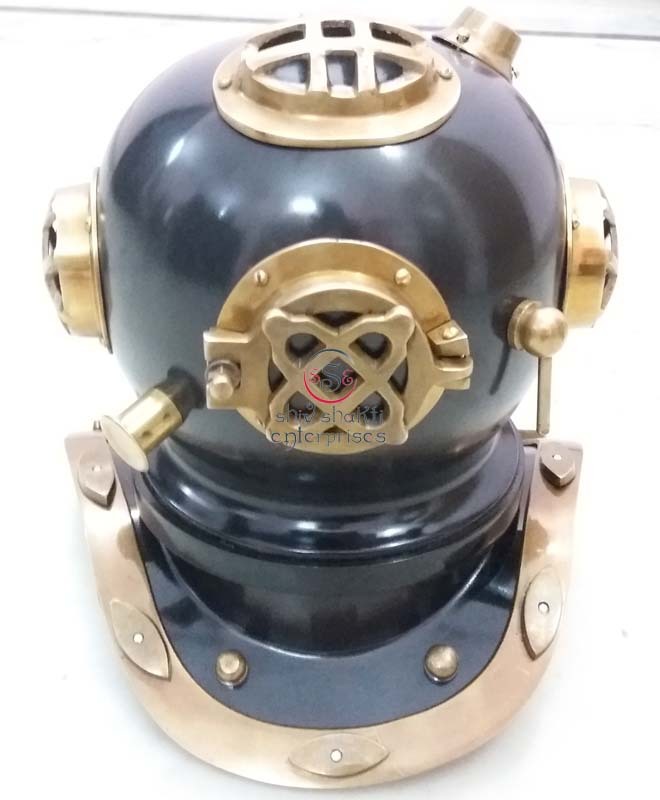 ﻿Our new, unique steel and brass antique diving helmet replica features handcrafted black powder coated sheet steel and solid brass, gleaming nickel finished fittings. 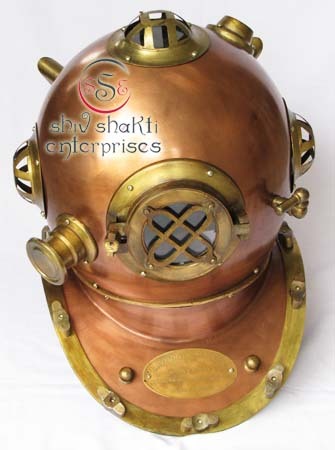 This is an excellent quality hand made helmet.﻿This Helmet has a marked Name Plate. 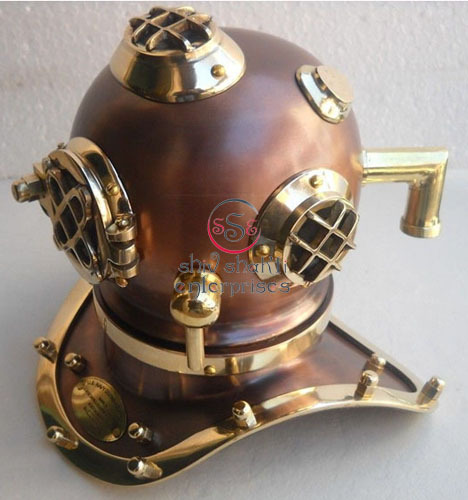 Made of solid brass & Iron. It is totally Hand Made. 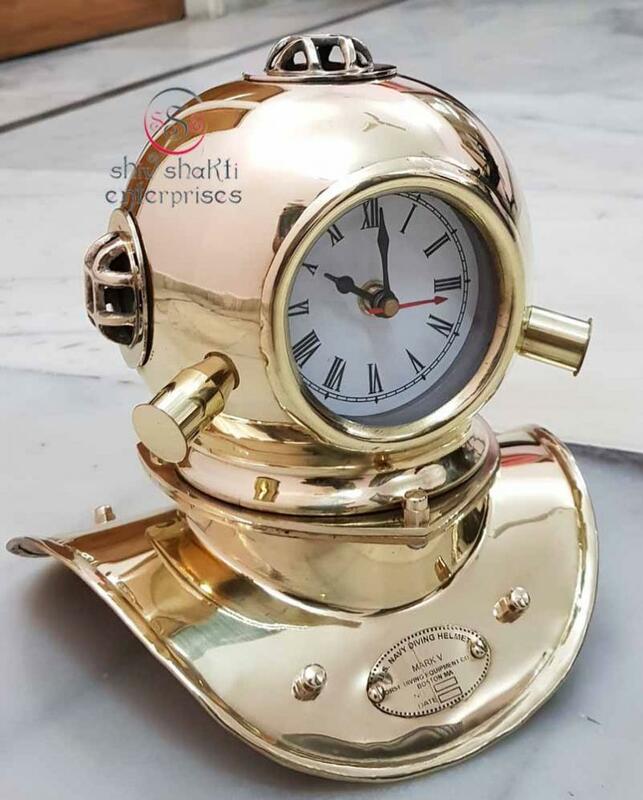 It is beautifully handcrafted Reproduction. Magnificent Black Coated Finish with Brass Fitting. Helmet is very Good Condition.It is totally Hand Made. 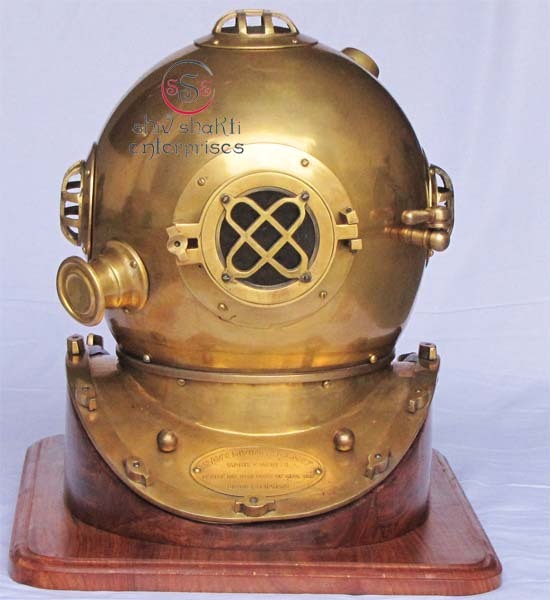 ﻿This is an excellent quality made helmet.﻿This Helmet has a marked Name Plate. 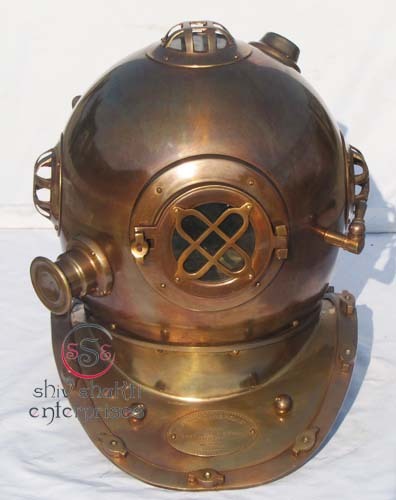 Made of solid brass & Iron . It has Brown Antique Finish. 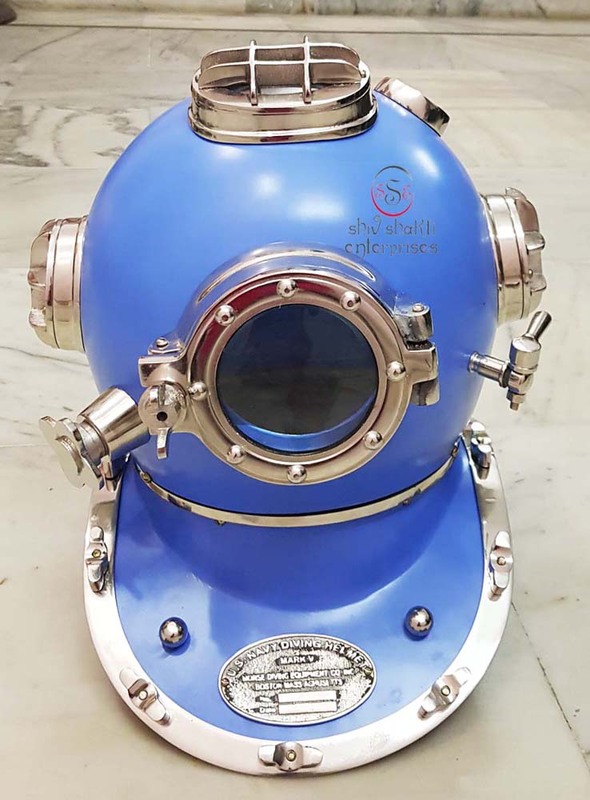 Helmet is very Good Condition.It is totally Hand Made. ﻿This is an excellent quality made helmet.﻿This Helmet has a marked Name Plate. 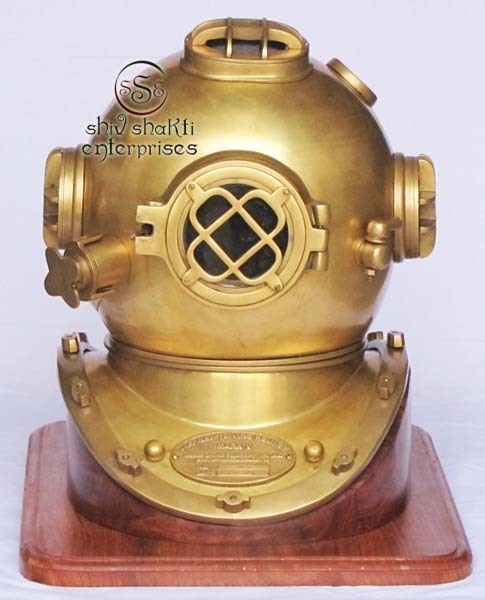 Made of solid brass & Iron . 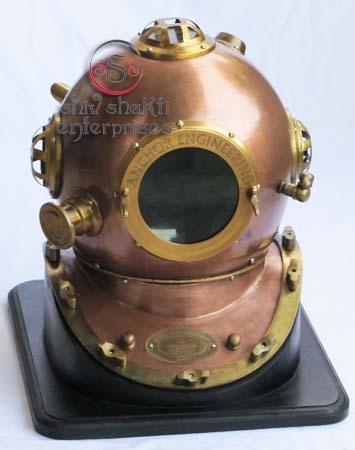 Helmet is very Good Condition.It is totally Hand Made. ﻿This is an excellent quality made helmet.﻿This Helmet has a marked Name Plate. 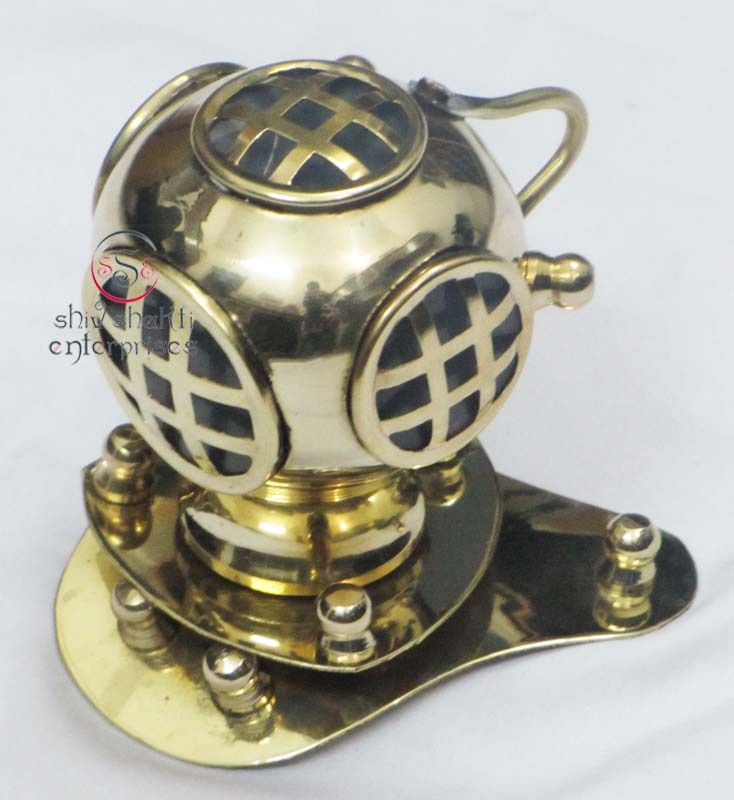 Made of solid brass & Iron . 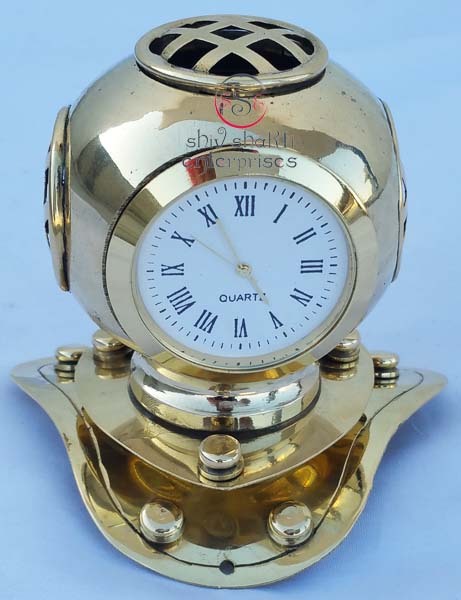 It has Old BrassAntique Finish. 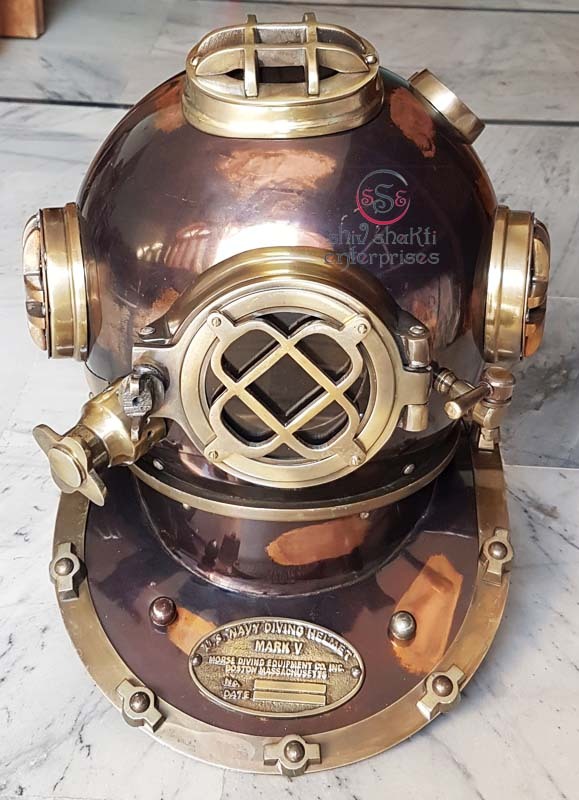 Helmet is very Good Condition.It is totally Hand Made. 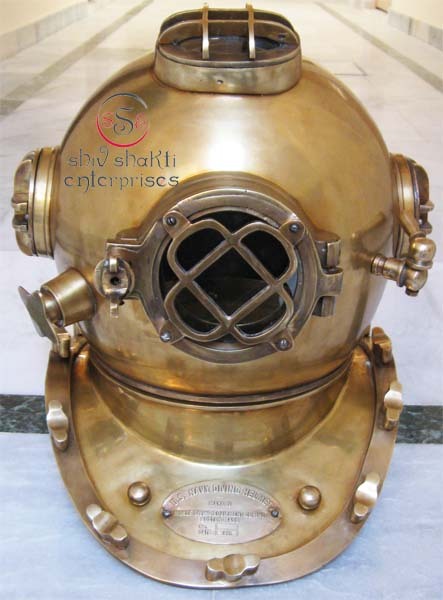 ﻿This is an excellent quality made helmet.﻿This Helmet has a marked Name Plate. 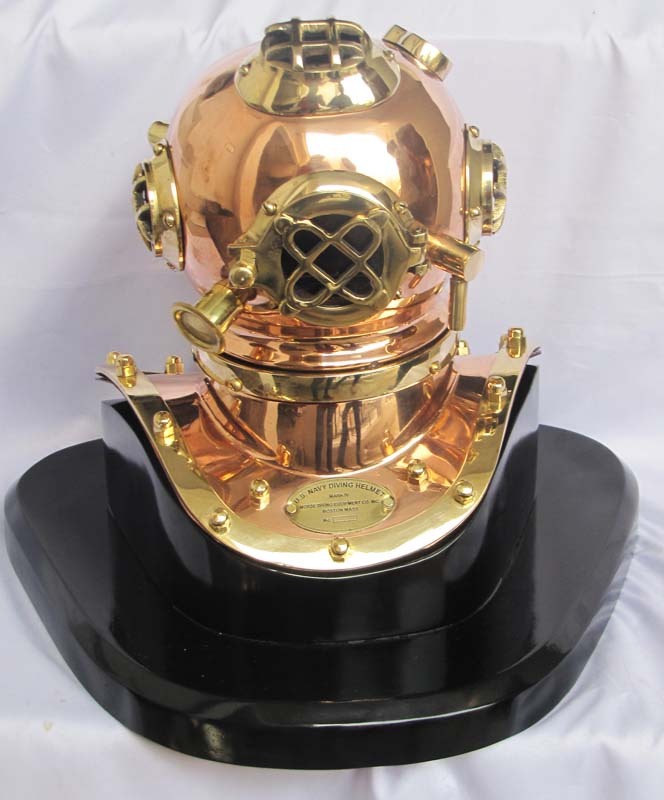 Made of solid brass & Iron . It has Black Antique Finish. Helmet is very Good Condition.It is totally Hand Made. ﻿This is an excellent quality made helmet.﻿This Helmet has a marked Name Plate. 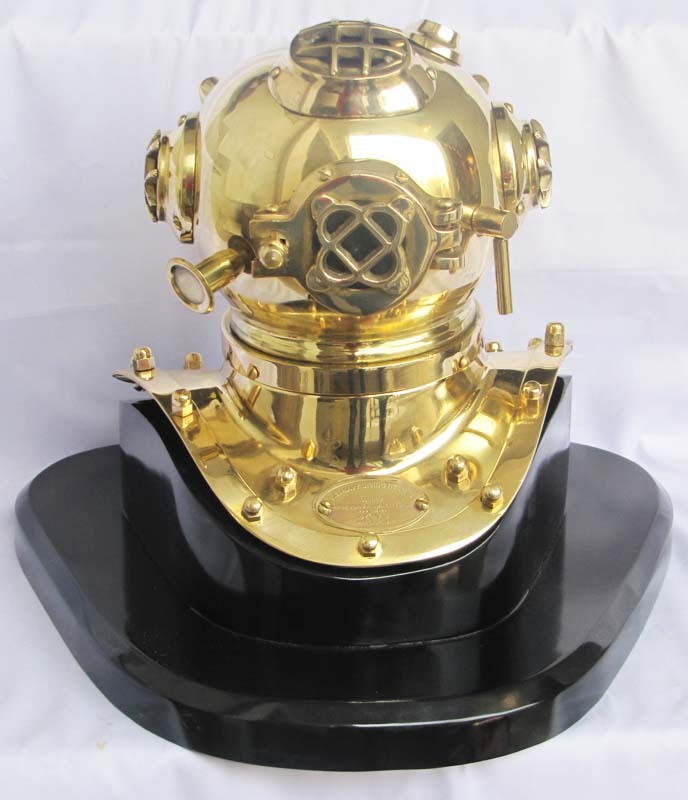 Made of solid brass & Iron . 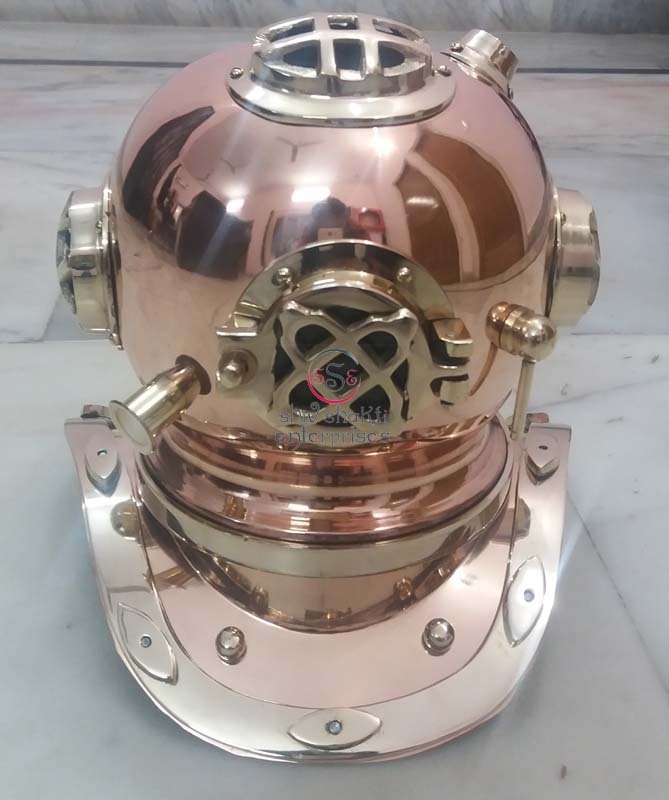 It has Brass & Copper Finish. Helmet is very Good Condition.It is totally Hand Made. ﻿This is an excellent quality made helmet.﻿This Helmet has a marked Name Plate. Made of solid brass & Iron . It has Polish Finish. Helmet is very Good Condition.It is totally Hand Made. ﻿This is an excellent quality made helmet.﻿This Helmet has a marked Name Plate. 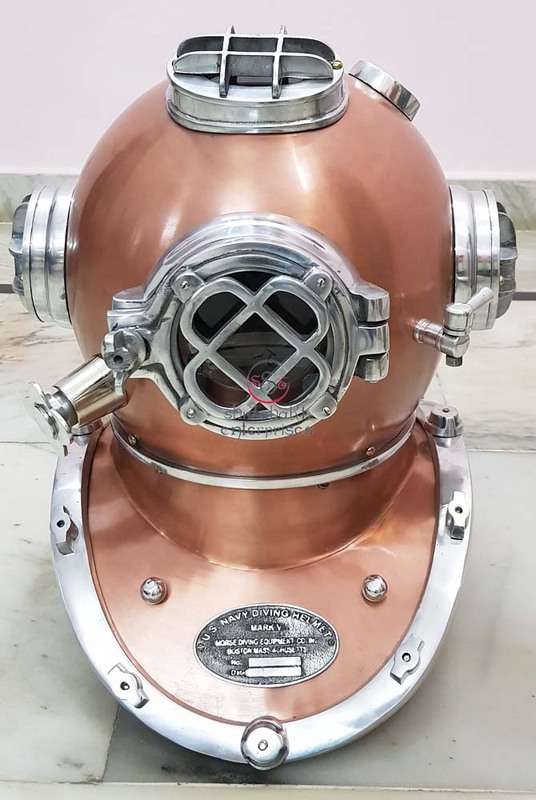 Made of solid brass & Iron . 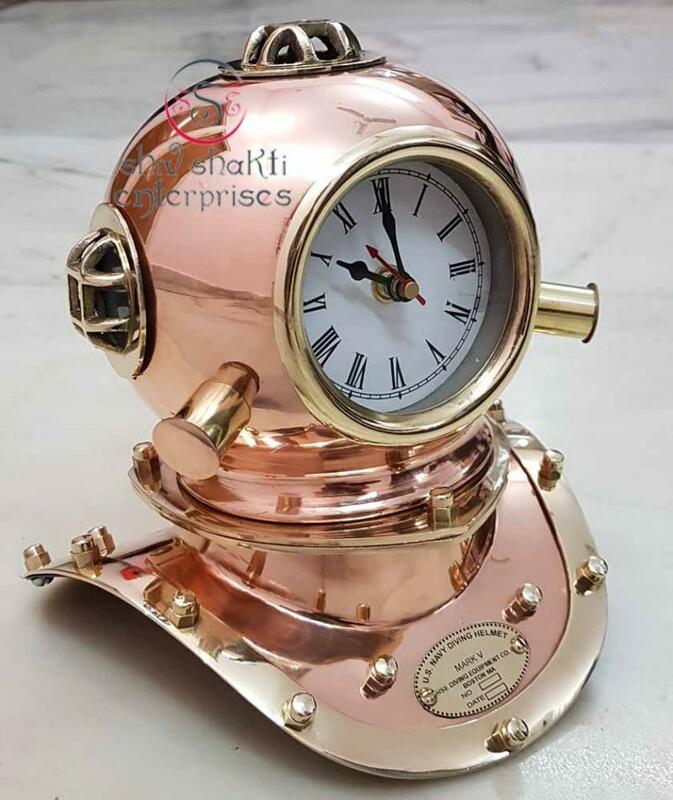 It has Copper Finish. Helmet is very Good Condition.It is totally Hand Made. ﻿This is an excellent quality made helmet.﻿This Helmet has a marked Name Plate. 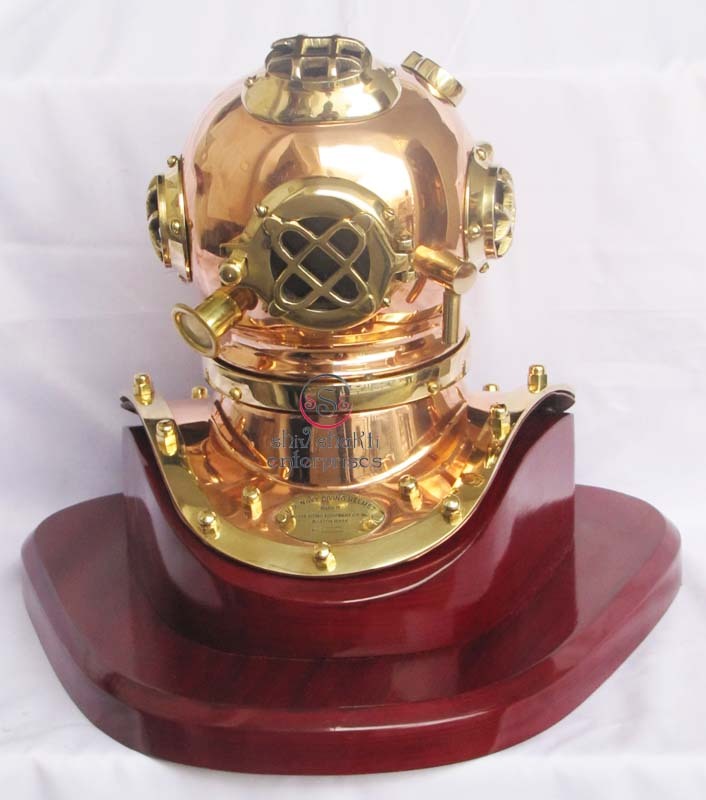 Made of solid brass & Iron . It has Black Powder Coated Finish. Helmet is very Good Condition.It is totally Hand Made. ﻿This is an excellent quality made helmet.﻿This Helmet has a marked Name Plate. 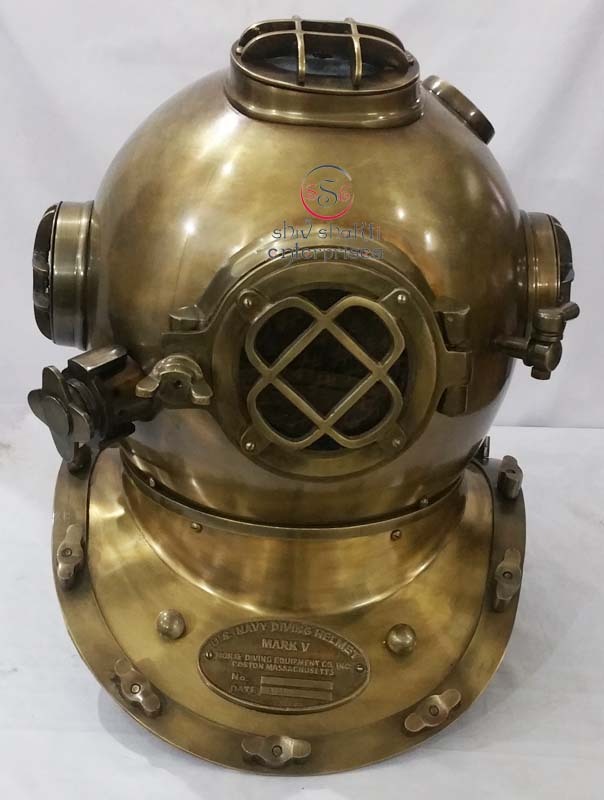 Made of solid brass & Iron . 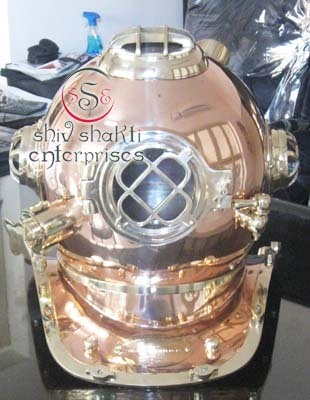 It has Brass & Copper Antique Finish. Helmet is very Good Condition.It is totally Hand Made. ﻿This is an excellent quality made helmet.﻿This Helmet has a marked Name Plate. 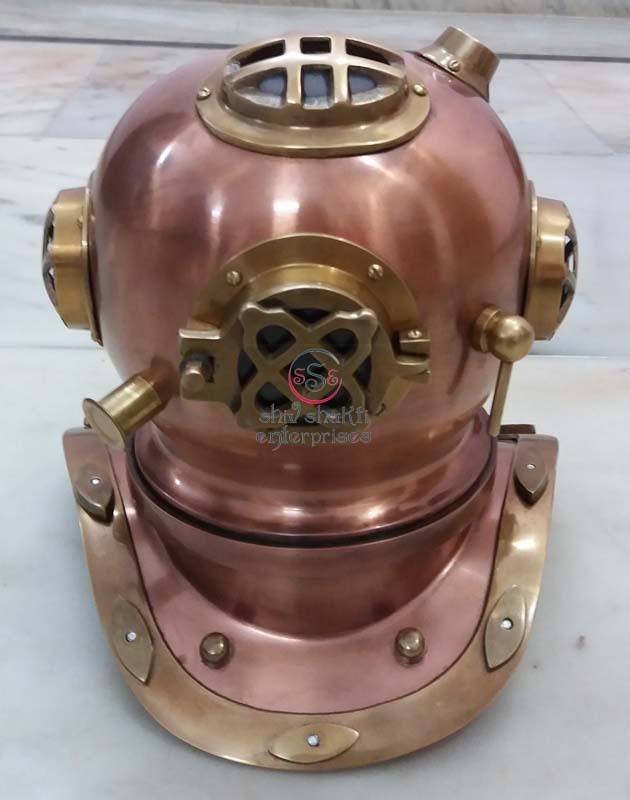 Made of solid brass & Copper . 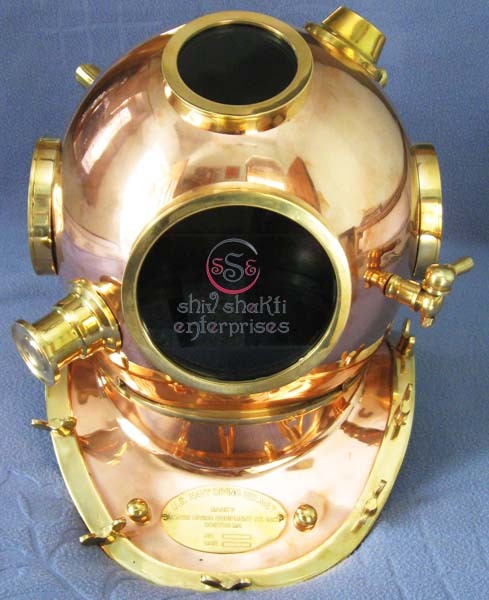 It has Brass & Copper Antique Finish. Helmet is very Good Condition.It is totally Hand Made. ﻿This is an excellent quality made helmet.﻿This Helmet has a marked Name Plate. 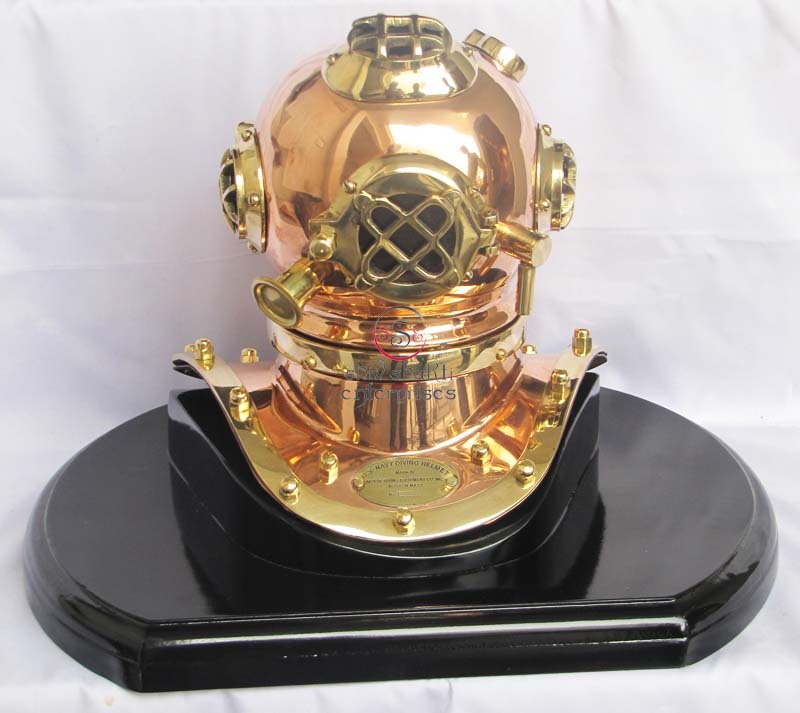 Made of solid brass & Iron . It has Black Powder Coated And Nickel Finish. Helmet is very Good Condition.It is totally Hand Made. ﻿This is an excellent quality made helmet.﻿This Helmet has a marked Name Plate. Made of solid Iron . It has Polish Finish. Helmet is very Good Condition.It is totally Hand Made. ﻿This is an excellent quality made helmet.﻿This Helmet has a marked Name Plate. 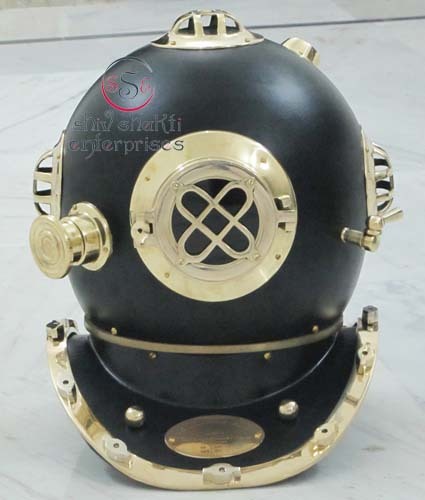 Made of solid brass & Iron . It has Chrome Finish. 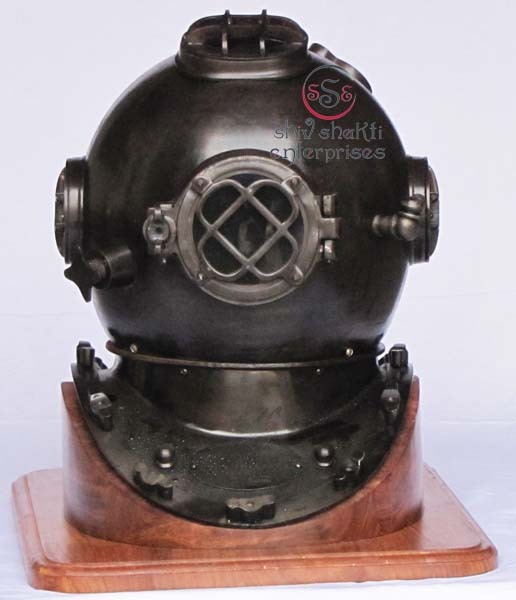 Home Nautical Decor Real Diving Helmets Replica at Great Gift. 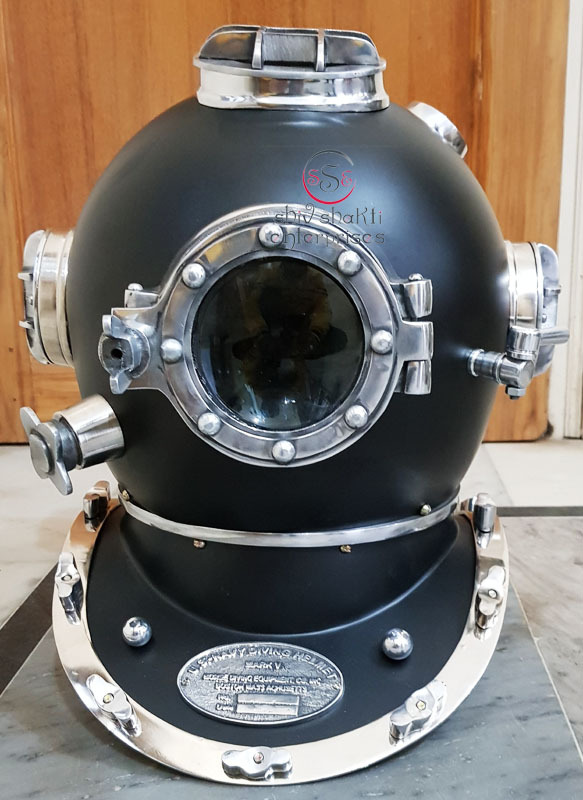 This is an excellent quality made helmet.It is totally Hand Made.Beautiful Finish Helmet for collector.Our beautifully handcrafted sea diver's diving helmet is a complete theme of nautical flair. Helmet is very good condtion. It is totally hand made. This is an excellent quality made helmet. This helmet has a marked name plate. 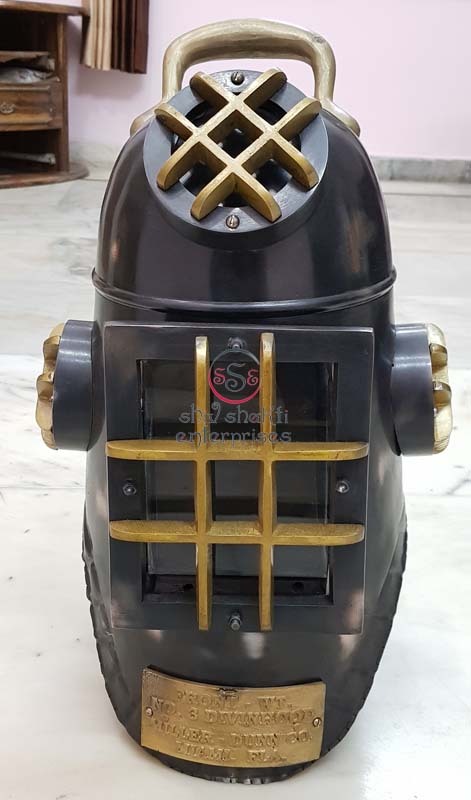 Made of solid brass and iron.